There may be smoke, but is there fire? Of course mobile is important—really important. There is a huge platform war underway among the Android, iOS, and Microsoft operating systems that intersect with an array of hardware players: Samsung, Apple, and others, that intersect with social and search giants Google and Facebook. And for the aggressive and innovative players, the stakes are high as they move and countermove in the battle for market share. All these players have sufficient assets to make the dramatic moves capable of changing the mobile world for years to come. This universe has become more important to the business community of late because along with the hardware and operating systems, the real money makers for those of us in the B2B world are business applications, content and mobile commerce. We are still in the infancy of mobile applications and commerce and how it will ultimately affect day-to-day business, but we know it has, and will continue to do so. But the more interesting question is who is buying mobile and for what? We asked. Last year it was clear that B2B applications still reign supreme as the center of interest. And that was with limited application beyond traditional supply chain—warehouse and services; and retail—pricing, ticketing and the scanning of the ubiquitous barcode. 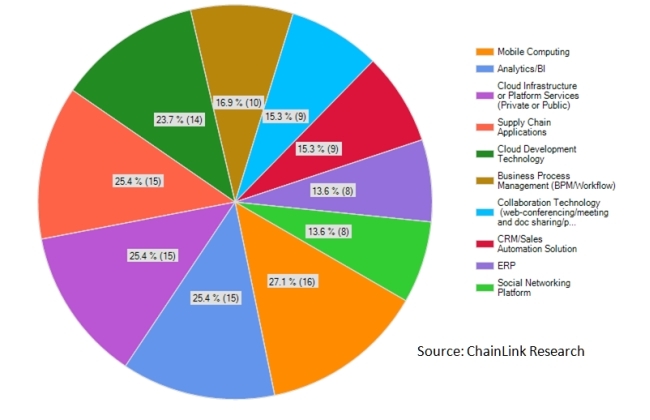 But B2B has changed a lot in the last year, with major providers finally listening to the users and coming out with an array of technologies—cloud, software and hardware—that extend the value of the smart phone platform for business applications, P2P (person-to-person), and business analytics and query, not just an auto-id reader. 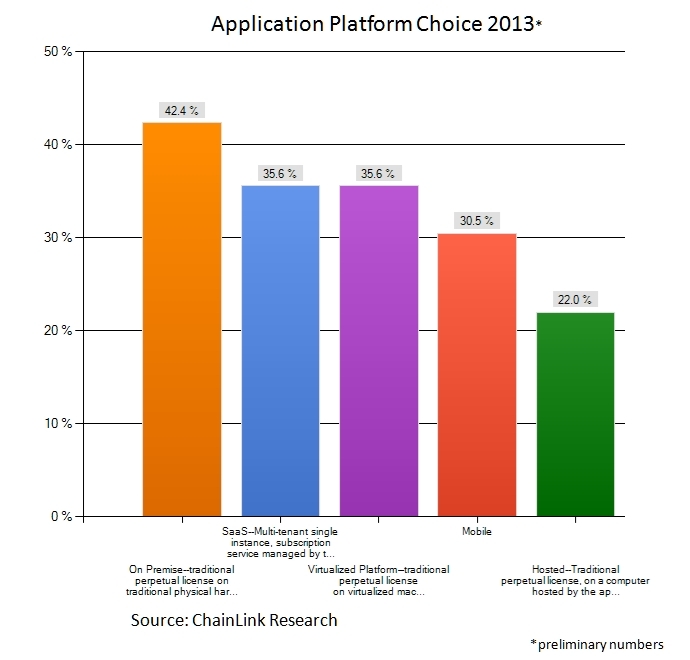 We asked which platform would be the focus for applications—cloud, on premise or mobile. As shown in Figure 1, mobile has come up in the world, from not even making the cut last year. And the development dollars are being poured into the mobile/smart phone platforms to provide a business friendly, functional UI. It’s critical for enterprises to think about multilayered foundations since traditional mobile devices as well as smart phones (and hybrids) now populate the enterprise. In fact, as the ‘new mobile’ traverses the business and consumer markets (B2B and B2C), it is not just the devices that are important, but the underlying infrastructures that support them. Companies need to concern themselves not only with applications, but with device/security management (MDM), and the wireless networks necessary to support both enterprise and ‘guest’ users in the BYOD scenarios for internal work spaces—office, warehouse, yard; and visitor spaces—waiting rooms/lobbies, retail space, classrooms, etc. These layers need to be highly scalable to handle complex challenges such as security and the demand for ever-increasing bandwidth as content sharing grows. The wireless network also needs to become more versatile. A great example is Motorola, which announced its BYOD wireless network to support retail last year. Just this month, they finally announced and launched their mobile POS. Motorola has had a huge presence in retail stores for decades, but for operations only. Again, we see this trend of intersecting universes. But what about the consumer? Consumers are overwhelmingly purchasing smart devices and are looking for more utility. Yet when they enter retail, options today are limited. Between the Consumer Electronics Show (CES) and the National Retail Federation (NRF) Shows in the last two weeks, you would think functions such as mobile payment were a done deal. But in reality, the game has barely begun, as pointed out by Frank Hayes1 in his article on PayPal’s mobile payment status (here). Though there are big-name chains who have signed up, they are using it in only a few of their stores, and there is no promotion/mention of having this mobile POS or how many customers use it. And ISIS, the AT&T mobile payment we have been hearing about, has not really launched. I met with ISIS folks multiple times last week at the NRF show—they were everywhere in the show, but nowhere in the store. And AT&T today only supports Android since many Android phones have NFC. Ironically, AT&T is the biggest carrier and distributor for the iPhone, but no sightings yet of ISIS on the iPhone. NRF 2013—a Quiet time of day! 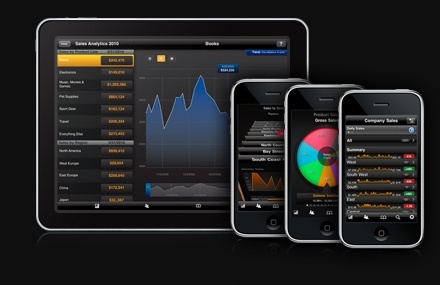 Everyone wants to move data from mobile to business applications. There is a stunning array of companies that provide that capability, and scores of retailers who have purchased these solutions for POS integration and store operations. And the range of providers is prodigious: Swift Exchange, and many newbie startups; ERPs like NetSuite, with their recent purchase of Retail Anywhere; Epicor’s Profit21 (and other retail solutions); Motorola’s POS; eBay/PayPal and everybody in between. Today, the manufacturing/logistics market has a relatively simple set of choices in combo device/software solutions. But retail is exploding and more players, not fewer, are entering the fray. Ultimately, there will be some consolidation, but don’t expect that for several years—especially in the US. Though the EU, UK and Asia have a running start, we haven’t really even left the shoreline. Actually, the amount of penetration into the US market by mobile POS is comparable to the Vikings landing in the Americas: noticeable from history, but having left virtually no imprint during the times. However, all that looks to be changing in 2013. Enter the budgets. 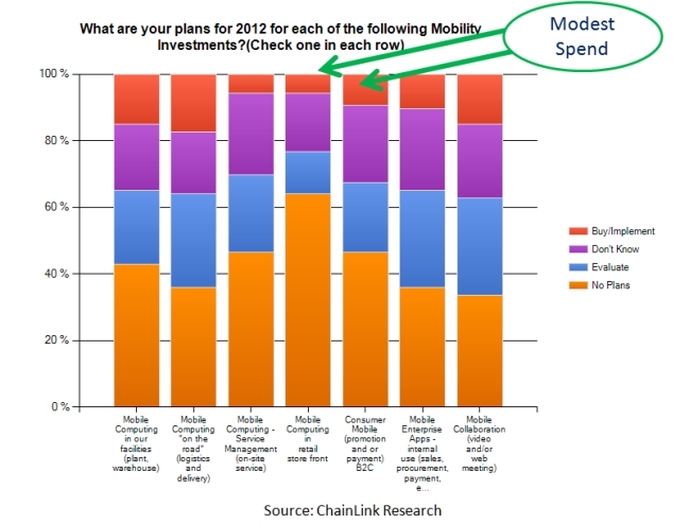 Mobile spending is forecasted to significantly increase with mobile a top priority for the enterprise (Figure 3). The demand is there, and enterprises are pushing the solution-provider market forward. But the challenge for the next few years will be to make sense of this new environment. What technologies and solutions to buy to support what kind of customer preferences? We predict that spending in 2014 will actually increase over 2013 numbers as users begin to make sense of the offerings in the market. This, of course, will spur more development. So think ‘road map’—innovation with flexibility—to embrace change for the future.